What an incredible piece of memorabilia. 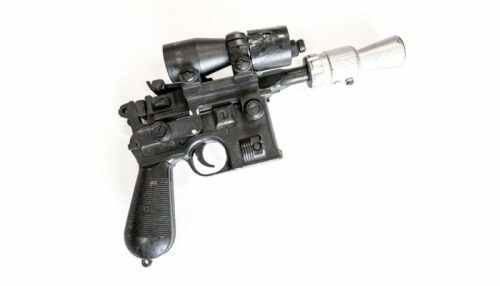 Amongst others, an original prop used by Harrison Ford himself will be auctioned by Julien’s Auctions. Click through to find out more. ← You Can Also Order The Black Series [Phase III] 6" Stuff Too! Let’s jump back to the Star Wars [Saga – Phase III] for tonight’s Visual Guide update, featuring the Ewok with Attack Glider (Assault on Endor) Ultra Figure. Click below to revisit this figure in our updated Visual Guide, and click here to check out our full review. One of the best lines Hasbro ever produced was the Star Wars [Saga – Phase III] Ultra line, which replaced the Deluxe figures. One of the best releases in that line is the Ewok With Attack Glider (Assault On Endor) set. See why this set literally “rocks” in our Research Droids Reviews today! Be sure to leave your thoughts in our comments section, vote in the poll or even comment about it on our Facebook page. Click the banner below for the direct link to the review! As always, you can also send your review requests via email if you’d like to see something that we didn’t cover yet.